I used to love taking my babies on bike rides when they were little. It was a great way to fit some exercise into my day, see the neighborhood, and get out of the house during that late afternoon witching hour! Something about the wind on their face and the constant change of scenery seemed to put each one of my kids at ease. So if you want to switch it up from stroller walks, grab helmets for two (I like these infant-sized helmets from Giro) and one of these baby bike seats, and get ready to ride. Unlike other bike seats, the iBert attaches in front of the seat on an adult bike, putting the child between you and your handlebars. While it seemed a little odd to me at first to have baby just right there — on the front of the bike! — kids will love the ability to get a front seat view to the ride while at the same time being close to mom or dad. This design also makes it easy for parents to keep tabs on their tot without turning around. 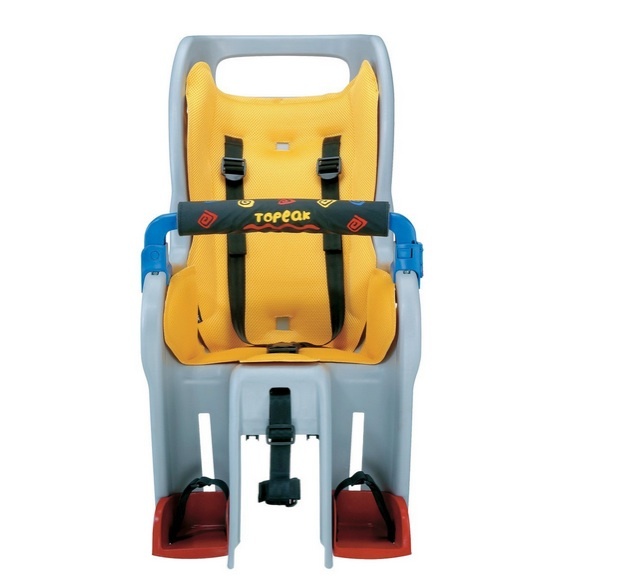 Though it will depend a bit on the size and height of your child, the iBert states that it is suitable for kids up to 4 years old or 38 pounds. If you like the concept of the iBert, but aren’t a fan of the extended leg position or low back support, I suggest the WeeRide Kangaroo DLX. 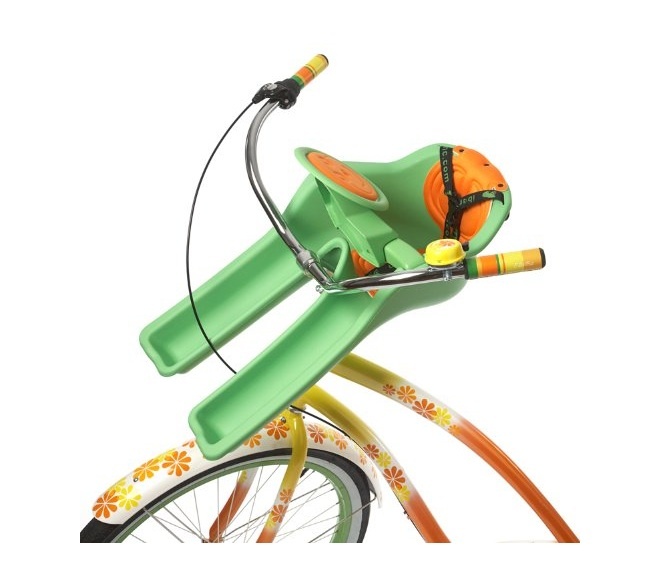 This bike seat is designed to offer better weight distribution, has large adjustable foot cups, a higher, well-padded back, and a large plush headrest where kids can hold on (and keep their hands away from your gears) or rest their head to take a snooze. I’ll start by stating the obvious: This primary-color explosion isn’t pretty. It baffles me why they can’t make these seats a bit easier on the eyes, but, having used this seat with all three of my children, I can tell you that in spite of its lack of style, this seat is sturdy, supportive, adjustable and safe. 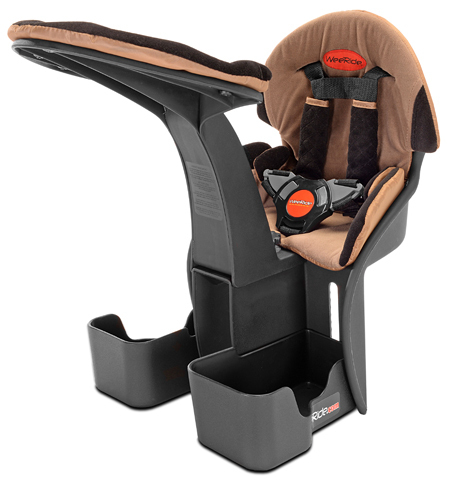 The deep wings make it comfy for backseat nappers and the roll bar adds extra protection plus a place to clip toys for younger babies. 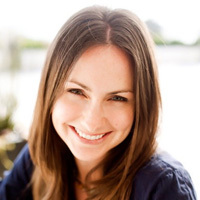 The seat weighs just seven pounds and can be used with babies once they are old enough to sit up unassisted with a bike helmet (Topeak suggests 12 months but we used it younger than that) and for kids up to 48.5 pounds. Plus the latest model comes with a suspension system to limit the impact of curbs and sidewalk cracks. I love Britax for their car seats, but they offer a child’s bike seat that has an amazing amount of adjustability to best fit your baby. This seat has 9 head rest positions, 15 foot rest positions and can adjust to fit kids from 9 months up to 40 pounds. 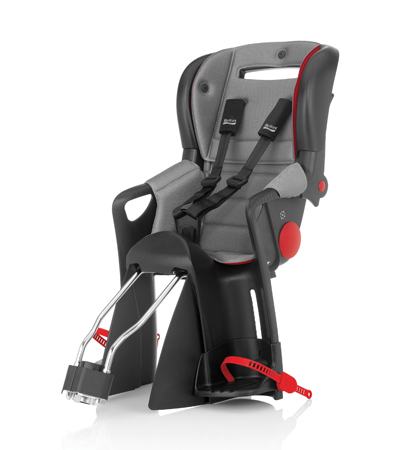 It also comes with integrated spoke guards, built-in suspension, two-position recline and a red/gray reversible, washable seat pad. Plus, I love that it’s pretty sleek-looking.